FORT WORTH, Texas (AP) -- Jon Rahm was at Colonial during tournament week each of the past two years to accept the Ben Hogan Award that goes to the nation's top college golfer. This time, he's playing in the PGA Tour event at Hogan's Alley and among the leaders. With his 4-under 66 on Thursday, Rahm was a stroke behind first-round leaders Kelly Kraft, Derek Fathauer and PGA Tour rookie J.T. Poston. That also put Rahm ahead of two-time Colonial champs Phil Mickelson and Zach Johnson after both birdied their last three holes for 67s. He also led 2016 winner Jordan Spieth, whose even-par round included six birdies. "The last two times I was here, all I recorded was super happy and positive memories," Rahm said. "It's just the vibe that I have around this place is so positive, especially with Sergio (Garcia) winning and with the Ben Hogan history that I'm related to now." The 22-year-old Rahm, the winner at Torrey Pines in January, had only one bogey while playing with Masters champion Garcia, the fellow Spaniard who won in his first Colonial appearance in 2001. Kraft and Graeme McDowell, tied with Rahm for fourth, had the only bogey-free rounds. Only 33 of the 121 players finished the first round under par. Scott Brown had the other 66, and had the outright lead at 6 under before a double bogey at No. 18. Spieth, coming off missed cuts the past two weeks, was tied for 34th his six birdies, four bogeys and a double bogey. He was even par after birdies on his last two holes. "It's a great finish. Kept me in the tournament," Spieth said. "If I was a couple over, you know, in the back of my mind I would be wondering about the cut line." After two bogeys on the first four holes, Spieth made 4-foot birdie putt at the 466-yard No. 5 hole, and made a 10-foot birdie at the 168-yard, par-3 13th. In between those birdies at two of Colonial's toughest holes, Spieth made a nearly 40-foot putt to save par after a wayward drive at No. 9. His drive at the 10th went into a concrete culvert for another bogey, and he missed the fairway right again at the 622-yard 11th, only to get back in the fairway and go on to a 2-foot birdie. "Hit some very solid shots. With gusty winds, it's not going to end up where you think it's going to a lot of the time," Spieth said. "I felt like I missed some fairways by 1-5 yards today. That made a complete difference in the way the hole played." Before his birdie-birdie finish, Spieth had double bogey at the 429-yard 15th, when he blasted from a fairway bunker through the green and into the water, and made bogey at the par-3 16th. Mickelson, back at Hogan's Alley for the first time since 2010, made an 8-foot putt at the 435-yard 7th hole, then hit his tee shot inside 2 feet of the cup at the par-3 8th. His 33-footer at No. 9 came after playing partner Matt Kuchar had just missed a slightly longer putt on the same line on their finishing hole. 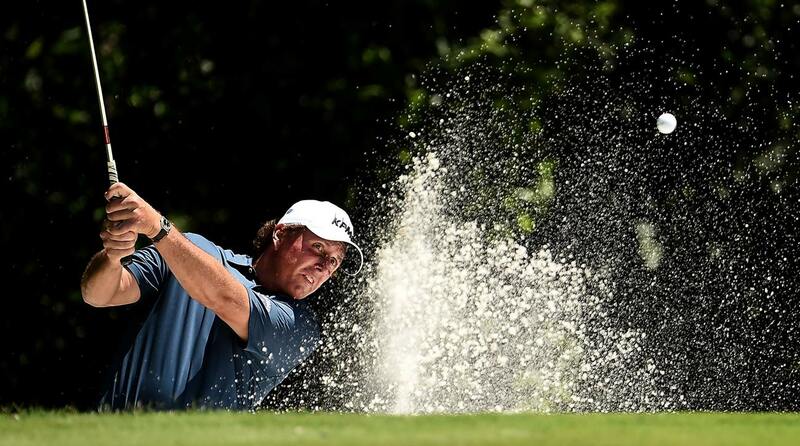 When changes were made to the course after his 2008 victory, Mickelson missed the cut in 2010 with a chance to become the world's No. 1 player. He later indicated that Colonial no longer suited his game. "Nothing real specific," he said, when asked what changed his mind. "It's been a while and I needed to ... I felt it was in my best interest to get in contention and try to play more events and try to get the scores, results out of it." Rahm was at Arizona State when he became the first two-time winner of the Hogan Award. His first competitive round at Colonial came a day after Arizona State's women rallied to win their eighth NCAA championship, and first since 2009. "To see them win in the fashion they did, it was amazing," said Rahm, who practiced with that team while in school. "The coolest thing is that's the closest I'll ever be to experiencing something like that and I'm happy for them. ... To be honest, that energy and positivity probably helped me today."